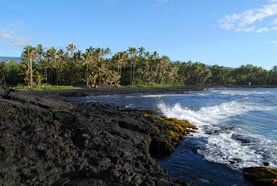 A visit to Hilo (pronounced hee-low) is a trip to the lush, green, breathtakingly photographic side of Hawai`i Island. 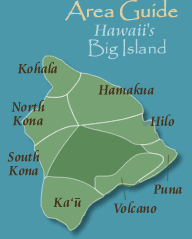 Be sure to save the location of our page in your browser, to find the latest information on the many events in East Hawai`i. Here one finds the anticipated Hawai'i -wild ginger blooming along roadsides, waterfalls plunging through hillside jungles, and rainbows cascading over lush vegetation. Hilo is blessed with more rain than any other city in the U.S. (averaging about 120" annually), and the gulches and slopes in the Hilo area have more shades of green than there are names for. The rain-washed air is sweetened by flowers and ocean spray, and wonderful to breath. Deep blue waves shatter into brilliant white spray against the jagged jet-black shoreline. Here we have green "beaches," where the grass meets the water. Colorfully dressed children splash in the calmer pools and sheltered beach areas edging Hilo Bay. Hilo, the Big Island 's county seat, wears a wide greenbelt of parks and soccer fields bordering its half-mile-long black sand beach. A highly competitive canoe meet is a "must" experience for visitors. If you are lucky enough to encounter Hilo's rain, grab an umbrella and go for a walk. The rain is blissfully warm, and brightly-colored umbrellas pop up everywhere. Have a picnic in beautiful Lili'uokalani Park; 30 acres of Japanese gardens with fishponds, gazebos, bridges, and a spectacular view across the bay of Hilo Town and the slopes of Mauna Kea. If you are lucky, you will see the snow-capped summit of the tallest mountain, from its base, in the world. Across a foot bridge is Coconut Island, just big enough for picnics and open-air concerts. 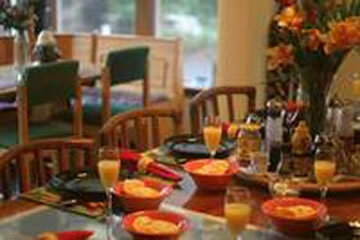 There are as many choices for meals as there are tastes. Enjoy "local" food at numerous restaurants, eat the cuisine of China, Japan, Viet Nam, Thailand, and the Philippines, or enjoy Continental and "Mainland" food with a unique Hawaiian accent. 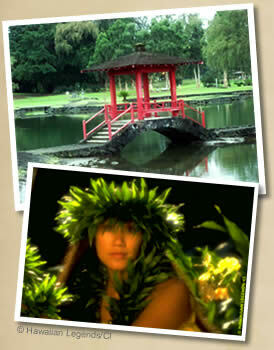 Hilo is home of the world-famous Merrie Monarch Hula Festival, the International Festival, the Aloha Festival, and many other events throughout the year. The Lyman House and Museum traces the history and culture of the diverse peoples who have come to call Hawai`i home. Our tropical zoo emphasizes tropical fauna and flora. Hilo is the gateway to the new Hilo-Hamakua Coast Cultural Corridor, with its historic plantation communities and its many beautiful waterfalls and scenic vistas. 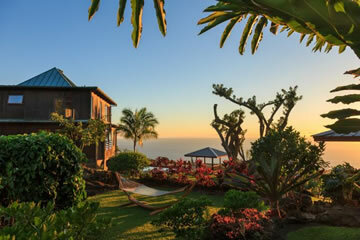 Hilo is the perfect place from which to visit two beautiful botanical gardens, spectacular Akaka and Kahuna Falls, Rainbow Falls, and Hawai`i Volcano's National park, which is only 30 minutes away. 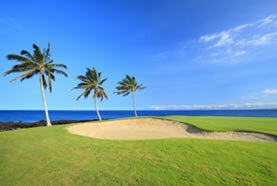 There are three affordable golf courses, tennis courts, an Olympic swimming pool, and a winter baseball league! Wai`anuenue ("Rainbow") Falls: just above town on Waianuenue Avenue. Morning sun creates a rainbow in the spray. Thunderously powerful after heavy rains. Boiling Pots: about 2 miles above Rainbow Falls on the same road. Spectacular after heavy rains. Richardson Ocean Park: swim and relax at HiloÃ•s best beach park. Naha Stone in front of the library: whoever could lift it would unite and rule the islands. King Kamehameha did both. Lyman House and Museum: missionary house from 1830's; one of the finest mineral collections in the U.S.; clothing and furnishings from Hawai`i's waves of immigrants. 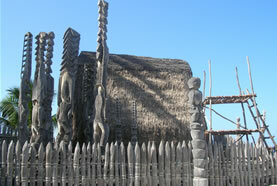 Wailoa Center and East Hawai`i Cultural Center: both have displays of local artwork. The Cultural Center also has a community theater. Enjoy Shakespeare in the park during the summer. Suisan Fish market: one of Hawai`i's last open-air fish auctions; auctioneer combines several Pacific and Asian languages. Beautiful fish are sold early in the mornings to the local groceries. Keaukaha: this community of Hawaiian homes and churches, also has protected ocean swimming, breathtaking scenery, spinner dolphins, and whales in the winter. Parades: Hilo loves a parade, and they happen throughout the year. Several are part of annual festivals, such as the beautiful Merrie Monarch hula festival in the week following Easter, Mardi Gras, the spectacular Lantern parade of the International Festival, and the Aloha Festival. 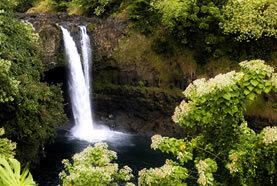 Akaka Falls: 11 miles north of Hilo, a one-mile path through tropical foliage loops past two spectacular waterfalls. Turn off the highway at Honomu, and follow the signs. 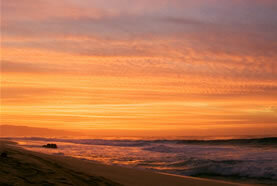 The town is a quaint plantation village, revived with nice gift shops and galleries. 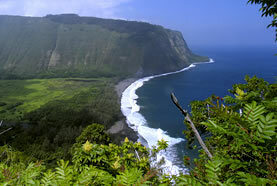 Onomea Scenic Route: a four-mile drive on the "old road," with beautiful views of Onomea Bay. 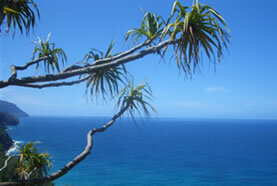 Consider visiting the Hawaiian Tropical Gardens along the way. Nani Mau Gardens: Just out of Hilo going toward the Volcano. Panaewa Zoo: In a rainforest, with tropical and rainforest animals. Listen to the parrot imitate its owl neighbor. 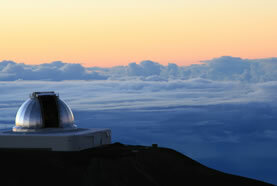 Onizuka Visitors' Center on Mauna Kea: astronomy exhibits, sometimes telescope views at night. Very cold at 9,000-foot elevation. Phone (808) 961-2180 for information and advance reservations. Mauna Loa Macadamia Nut Corporation: see macadamia nuts being processed, and taste Hawai`i's wonderful treat.